BWA parntered with Dare to allow schoolgirls to experience university life. Thirty Soweto schoolgirls experienced campus life at Wits on Wednesday, August 15, through an initiative by the Business Women’s Association (BWA). 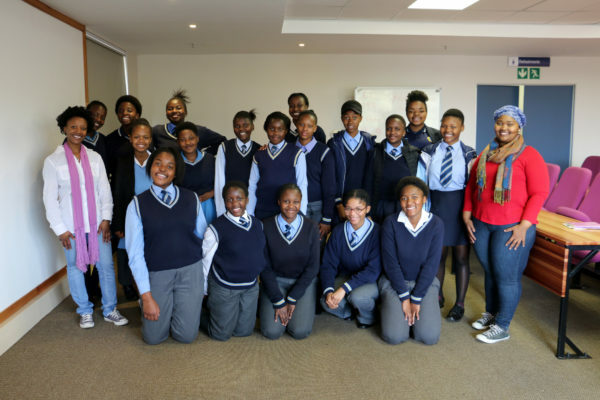 The BWA student chapter at Wits partnered with the Dare Restoring Worth Organisation (Dare) to inspire the girls to come to university after they finish high school. “Dare is about empowering young people, especially in high school, about preparing for the world of work and also being positive contributors to society,” said Julia Nkosi, founder of the organisation. “We partnered with BWA so that we can give [the girls] an idea of how varsity actually works … what it takes to get into varsity, how many points they need and choosing the right subjects,” she added. Chairperson of BWA Wits, Boikhutso Mokoto, a third-year LLB student, told Wits Vuvuzela, “The event is a first of its kind for the BWA student chapter and is being launched within the Wits community to begin with. “We do intend to extend the programme to the other chapters in the near future upon the success of this event,” Mokoto added. The girls were chosen based on their academic achievements, their leadership qualities and their personas to want to make a difference in the world. They were partnered with mentors for the day made up of both of BWA members and non-members. The girls’ day included coffee at The Matrix, attending psychology and law lectures and interacting with the Student Enrolment Centre. Sinethemba Mani, an 18-year-old matric student, told Wits Vuvuzela that she wanted to become a journalist before coming to Wits, but the visit had changed her mind. “I attended a psychology lecture and found it very interesting. I’ve realised that I will consider journalism as my second option,” she said.